Gordon is seen here in a satellite image from around 1 p.m. CT Tuesday. 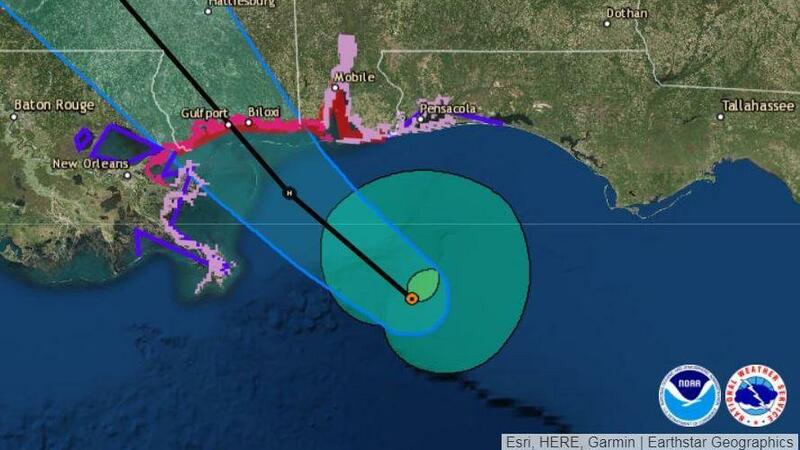 Gordon is predicted to make landfall as a hurricane and hit the Mississippi coast late Tuesday. Forecasters say a dangerous storm surge could bring flooding to a wide stretch of the Gulf Coast. As of 2 a.m. ET, maximum sustained winds had decreased to 50 mph, with higher gusts. The storm was moving at 14 mph, some 40 miles west of Mobile, Ala.
Its current path indicates it will move inland over the lower Mississippi Valley through Wednesday. An oak tree fell on a mobile on the south side of Pensacola, Fla., killing one child, according to Escambia County Emergency Communications. The NHC says Gordon is expected to unleash a slew of hazards in several southern coastal states, including torrential rain, life-threatening inundation, powerful winds, and tornadoes. By midday, Gordon brought heavy bands of rain to areas from Panama City, Fla., to New Orleans. 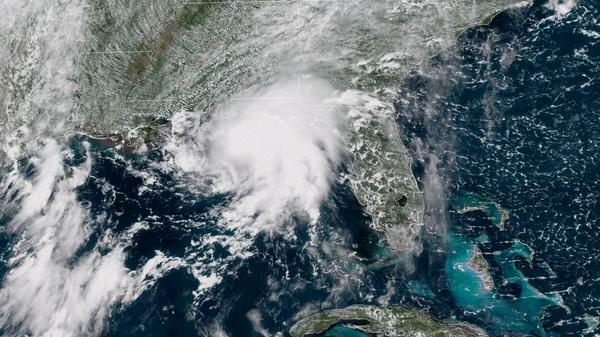 In Tallahassee, the National Weather Service office said dangerous currents had forced closures at beaches in the Florida Panhandle and Florida's Big Bend. A storm surge of 3-5 feet is possible for all of coastal Mississippi and from Shell Beach in eastern Louisiana to Dauphin Island, Ala., the hurricane center says. "The deepest water will occur along the immediate coast near and to the east of the landfall location, where the surge will be accompanied by large waves," according to NHC meteorologist Richard Pasch. The storm is expected to bring drenching rains along a path from the southwest corner of Alabama and central Mississippi late Tuesday to parts of Louisiana and southern Arkansas by Wednesday night. It's expected to veer north and eastward as it brings heavy rainfall to Missouri and neighboring states over the weekend. Louisiana Gov. John Bel Edwards, Mississippi Gov. Phil Bryant and Alabama Gov. Kay Ivey all declared emergencies in their respective states to free up personnel and equipment ahead of the storm. The storm is forecast to rapidly lose force now that it's made landfall. But forecasters warn that flash floods could be triggered by heavy rainfall from the western Florida Panhandle to Louisiana, with 4-8 inches predicted in many areas. Isolated areas could see up to 12 inches of rain, the weather service says. If Gordon slows its forward motion that could add to rainfall totals in the region. The third hurricane of the Atlantic season developed on Tuesday, after Florence's winds strengthened to top 75 mph out in the open ocean. The storm doesn't pose a threat to land through the weekend, and it could lose strength late this week, the National Hurricane Center says. Tropical Storm Gordon formed Monday morning near Key Largo, Florida and is expected to bring heavy rain, gusty winds and possible tornadoes to portions of South Florida Monday afternoon and night. The storm is then likely to continue strengthening as it moves into the eastern Gulf of Mexico Tuesday, before making landfall across the central Gulf Coast states Tuesday night.